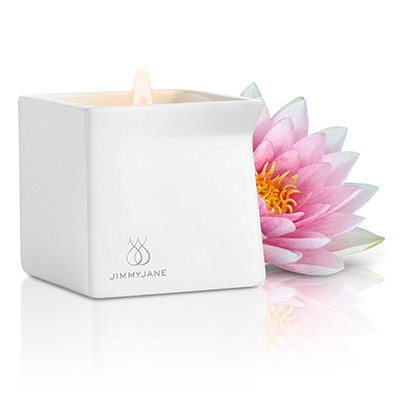 JimmyJanes' Afterglow massage candles are specifically formulated to engage all the senses, leading to intimate, sensual and the most relaxing of experiences. Each of the four scents offered will trigger a reaction, and with your partner you can guide this through pure relaxation, up to the most heightened levels of arousal. JimmyJanes’ Afterglow massage candles are specifically formulated to engage all the senses, leading to intimate, sensual and the most relaxing of experiences. Each of the four scents offered will trigger a reaction, and with your partner you can guide this through pure relaxation, up to the most heightened levels of arousal. Made from natural ingredients such as Jajoba, Shea Butter, Soy and Aloe, these candles will also help rehydrate skin. But are completely body safe and free from Paraben. The sensual oils will melt at a low temperature, ensuring they will not burn the skin (though it is always recommended to check the temperature before pouring). They are also made from oils, not wax, so they will not solidify as they cool. Body temperature will keep the oil in a liquid form. Supplied in a porcelain container with an easy pour spout, the quality of the presentation also leads them to be a perfect present. Pink Lotus – delve into the liquid depths for this stronger lower level floral scent. Sets the mood for any seductive encounter. Cucumber Water – enjoy the refreshing sensation that only this scent can bring. Light and aromatic. 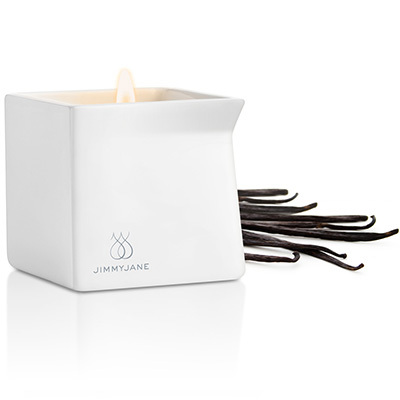 Dark Vanilla – feel the sweet sensations with a complex level of fragrance. A familiar and provocative scent. Melt at low temperature so as not to burn.